NQ Mobile (NQ) is the leading global SaaS provider of mobile security and productivity solutions for smartphones. NQ’s mobile security services protect users from the rapidly increasing problems of mobile malware, data theft, and privacy intrusion. A report released on April 15, 2013, reported that mobile malware threats increased 163% to more than 65,000 in 2012 over 2011. Further, the problem is becoming more complex as smarter mobile malware can better target connected devices. In February 2013, a new type of mobile malware was discovered that could jump from an Android device to infect a PC when they were connected via the USB port. Given the wealth of personal and financial data stored on smartphones (credit card data, health records and information, private pictures, etc. ), malware will continue to shift its focus from PCs to smartphones. NQ Mobile identifies and neutralizes more mobile malware first than all other mobile malware companies in the world combined. NQ’s products run exclusively on smartphones rather than low-end feature phones. NQ’s suite of products is delivered in a cloud-client platform, allowing for continuous monitoring and updates. NQ operates a freemium SaaS business model. As of December 31, 2012, NQ Mobile has a large, global user base of 283 million registered user accounts and 98 million monthly active user accounts through its consumer mobile security business, 65 million registered user accounts and 13 million monthly active user accounts through its mobile games advertising business and over 1,200 enterprise customers. NQ Mobile is adding over 400,000 new registered users daily. Curiously, NQ’s short interest has recently ramped from 2.2 million shares at the end of February 2013 to 3.6 million shares at the end of March 2013 (more comments on the recently increased short position lower in this article). This ramp in the short position occurred despite the fact that NQ’s fundamental story is extremely compelling, the valuation is dirt cheap, the company continues to execute exceptionally well and revenue will likely grow 100% year-over-year in 2013 to over $183 million. NQ reported another beat and raise quarter on March 6, 2013; 2012 full-year revenue increased 126% over 2011 to $91.8M, NQ raised its 2013 full-year revenue guidance to $178M-$183M (up from $150M-$155M) and NQ has already announced numerous meaningful distribution deals in 2013. Distribution deals announced before the March 6th earnings call are already reflected in the 2013 guidance given on the call. Distribution deals announced after the earnings call are incremental to the 2013 guidance. US Cellular -U.S. Cellular will offer NQ Mobile’s Family Guardian product under the name U.S. Cellular Family Protector powered by NQ Mobile to its 5.9 million customers. Yes…all of the above-mentioned distribution deals were announced since the beginning of 2013!! NQ stated on the last earnings call that the deal pipeline is full for 2013. Here is a framework for how to think about the incremental EBITDA contribution for every 100 retail wireless stores NQ adds to its distribution network. Given NQ reports net revenue (after the revenue share to the retail partner) and the retail partner is responsible for the sales and marketing, the incremental EBITDA contribution margin is extremely high for every 100 additional wireless retail stores added. For additional conservatism, I am assuming the retail pricing of NQ’s products sold outside of the US is less than 1/3 of the price they are sold for in the United States. This assumption is likely overly conservative. When NQ’s growth rate and financial performance are examined in conjunction with one another, it is startling how inexpensive NQ’s shares are currently. 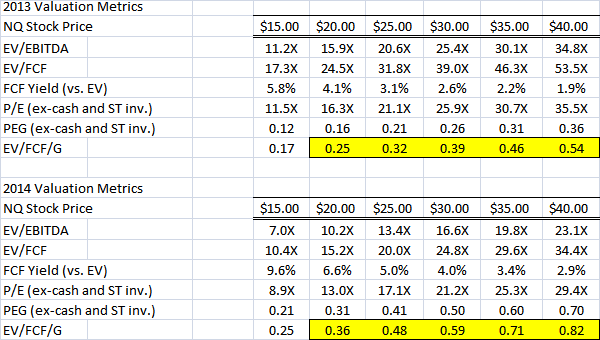 My preferred growth valuation metric is EV/FCF/G, as I believe it is more insightful than a simple PEG ratio. EV = Enterprise Value, FCF = Free Cash Flow and G = Growth. “EV” is preferable to “P” since EV takes into account the whole balance sheet and does not reward heavily levered companies nor penalize companies with large net cash positions. P (Price) solely relates to a company’s market capitalization and does not adjust for strong or weak balance sheets. NQ has a spectacular balance sheet with $2.39/share of net cash and zero debt. “FCF” is preferable over “E” as free cash flow is the life blood of a company and reported E (net earnings) can be easily manipulated. Investors generally believe companies with an EV/FCF/G ratio under 1.0 are compelling since an investor is receiving growth at a very reasonable price. NQ has an EV/FCF/G ratio of just 0.08!! In other words, NQ’s low multiple valuation (EV/EBITDA or EV/FCF) is even more compelling when considering its hyper-growth rate. Please note, I went back and added ever further levels of conservatism to my NQ financial model (as reflected in my numbers above). Hence, I believe NQ will meet or exceed the numbers in the above financial table. Also note, I use fully diluted shares for valuation purposes instead of just shares outstanding to provide even further conservatism. So….what are the shorts playing for and why are they ramping the short interest now? It seems there is a rumor going around that PricewaterhouseCoopers (NQ’s auditor) is scrubbing all of its Asian customers’ financials super duper extra hard to ensure everything ticks and ties. This is a good thing. The shorts believe NQ will be forced to use its 15 day filing extension for the 20-F and will miss the extended 20-F filing deadline on May 15, 2013. The shorts believe the complexity of the Feiliu and NationSky acquisitions in late 2012 and PwC’s extra tough diligence will lengthen the auditing process for NQ past May 15. The shorts’ strategy is to wait for their hoped May 15 deadline to pass and then spread rumors about shady happenings at NQ. However, they appear to be wrong! Unfortunately for the shorts, it appears the shorts’ information is completely inaccurate. NQ appears to be on track to meet the May 1 regular filing deadline. In fact, the 20-F could be filed as soon as the week of April 22. A timely 20-F filing will be a significant positive catalyst as it will signify another clean bill of financial health from the best and toughest financial auditor (PWC). Two results will likely follow from a timely 20-F filing by NQ. First, the large short interest that has built over the past several weeks betting on a delayed filing past May 15 will likely cover their short positions due to their failed short thesis. Second, several large institutional buyers that met with the company on the recent road show have been waiting to buy NQ stock until they review NQ’s 20-F. A timely filed 20-F will likely lead some of these institutional fence sitters to finally build long NQ positions. The dual buying dynamics of both the shorts covering and the incremental long institutional buying should take NQ’s stock price well over $10. Further, a strong 1Q13 report in May 2013 should clear the way for NQ to trade well above its $11.50 IPO price and into a $12-$15 trading range. As NQ continues to execute on its current deals and announces additional new distribution deals through the remainder of 2013, NQ should trade towards its fair value of $20-$35+. Referring to the highlighted sections in the table above, given NQ’s extremely strong growth, pristine balance sheet and exceptional FCF generation, Fair Value is $20-$35+ based on either 2013 or 2014 EV/FCF/G (or PEG, if you prefer) valuation metrics, as they are well all under 1.0.